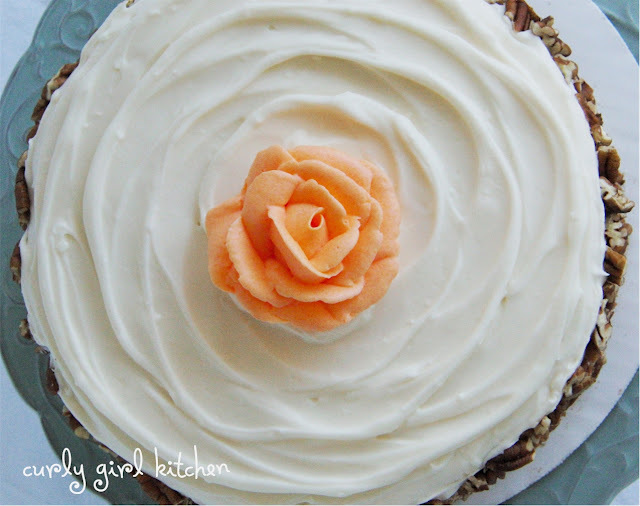 Carrot Cake was a favorite of mine as a kid - I remember requesting carrot cake for quite a few birthdays - so I was excited when a friend of mine, Gina, requested carrot cake for her 30th birthday party. I'm also thrilled to share that I'm taking baby steps towards my own baking business, and have three orders coming up this weekend! This is something I've wanted for so long, and I'm finally working at building up a client base. This is something I'll only be able to do for local customers, in the Denver metro area. As much as I love carrot cake, I've never posted a recipe for it on my blog, so I'd say it's about time I baked one. Last Thanksgiving, I made a four-layer pumpkin cake with lots of fall spices that my dad declared "the best cake he'd ever tasted", so I tweaked that recipe to replace the pumpkin with lots of grated carrots and applesauce, which, along with buttermilk and brown sugar, gave the cake such a moist, dense richness. 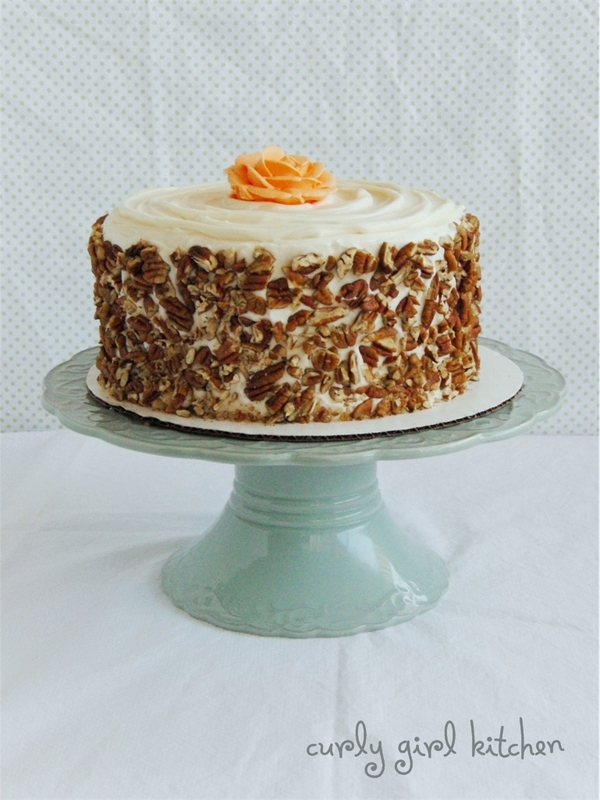 I'm a purist when it comes to carrot cake. I've never cared for it when it's full of raisins, apples, pineapple, or whatever else is sometimes added. I think all those elements distract from the pure sweetness of such a humble vegetable, so mine is full of that wonderful carrot flavor, enhanced with cinnamon, ginger and cloves. If you've never baked with browned butter, you really should try it. Browned butter is just butter that's been melted and then cooked for a few minutes to evaporate a bit of the water and brown the solids to a golden brown. Added to cakes, browned butter gives the cake such a nutty, rich flavor, and this was truly one of the best carrot cakes I've ever tasted. I wish you could see the three beautiful layers inside, but I didn't get a chance to take a picture after cutting it at the party. 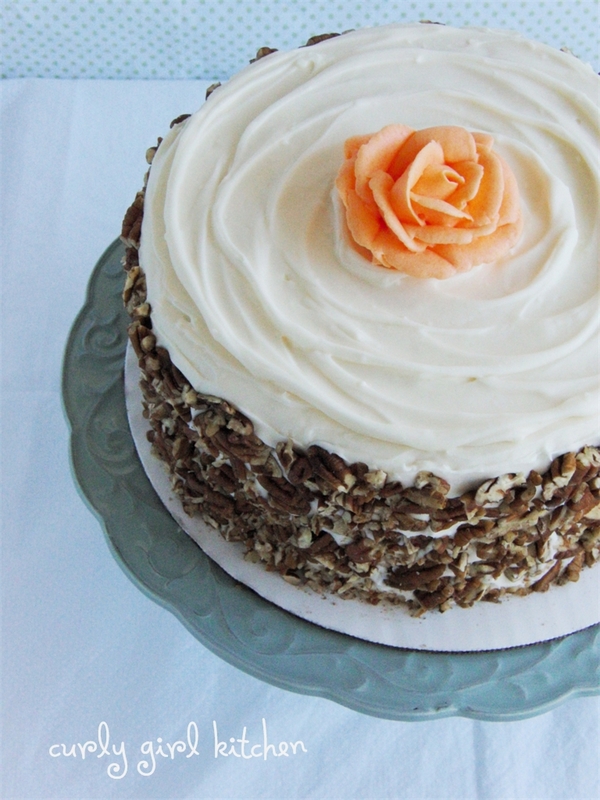 For many people, I think eating carrot cake is simply a vehicle for the cream cheese frosting. For a twist on the classic, I added salted caramel to mine, which you may not even know is there if I didn't tell you, but it added a subtle richness to the creamy frosting. And for a classic finish, I pressed lightly toasted, chopped pecans against the sides of the cake. 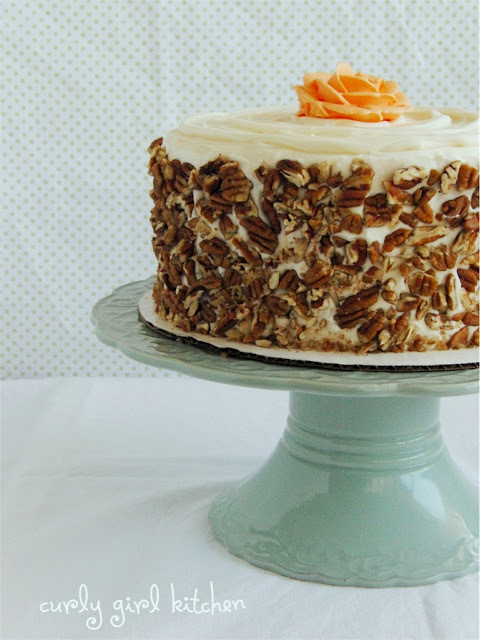 The crunch of the pecans with the sweet frosting and spiced cake was a delicious contrast. 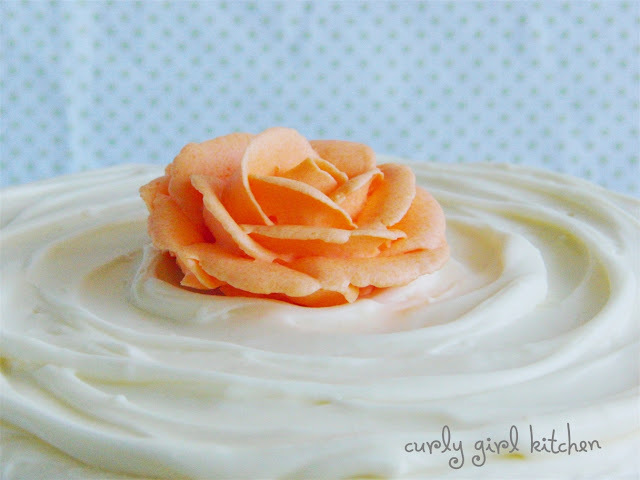 And instead of piping a carrot on type, I topped mine with a pretty orange rose. In the bowl of a stand mixer fitted with the whisk attachment, combine the butter, cream cheese and caramel. Beat on medium low for 1-2 minutes until well combined. In a separate bowl, combine 5 cups of the powdered sugar with the meringue powder. Add to the mixing bowl, a cup at a time, mixing on low to combine. Add the vanilla. Increase speed to medium and beat for 2-3 minutes until smooth and creamy, adding the last cup of powdered sugar, if needed, to reach the desired consistency. When the crumb coat has set, finish frosting the cake, swirling as desired (note, this frosting is not the right consistency for piping flowers or other designs, as it will not hold its shape well; for the rose in the center, I made a small amount of stiff buttercream). 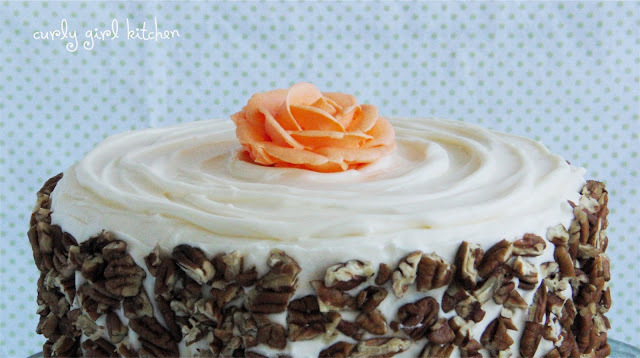 Press the chopped pecans against the sides of the cake.